I realize this will ruffle the feathers of those who believe in looking for advantages under every rock, or that by just letting little Johnny the 6 minute miler into State, he'll suddenly get motivated to work hard, but I'll say it anyhow. 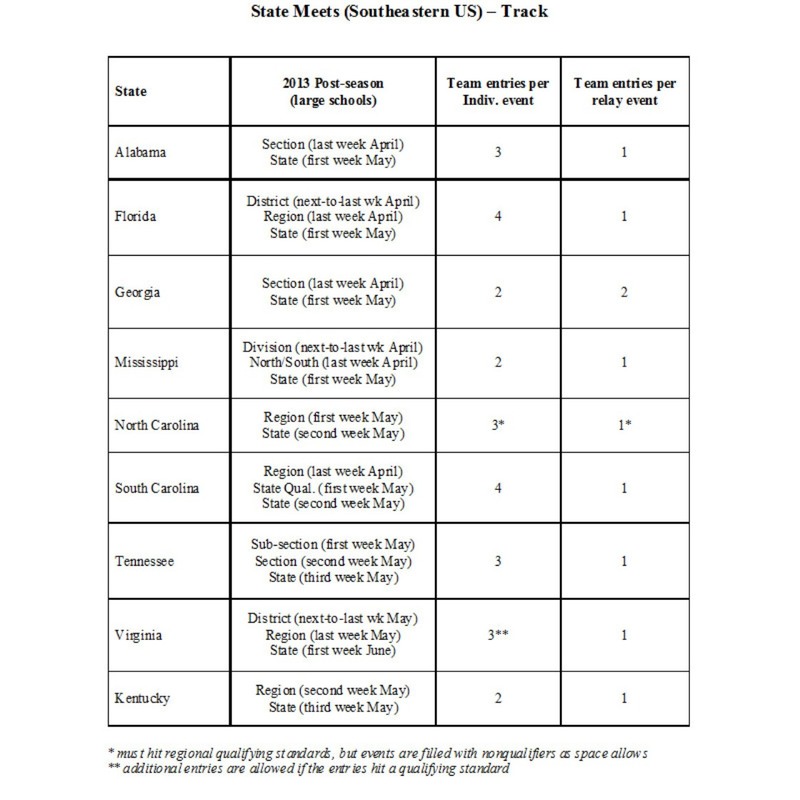 Now that the KHSAA has decided to follow the lead of other southeastern States and move the State Meet up to mid-May, the number of opportunities for track athletes has been reduced quite significantly. This comes at a time when the level of quality within our state is on the rise. If we're going to act like a southeastern State and move up the State Meet, then we should be even more like the other southeastern States and increase the number of entries a team can put in each event at the Regional Meet. (Assuming I did everything right) I've embedded a table below that shows the States which are typically thought to make up the Southeast, and that table lists the number of individual entries and relay entries each school is allowed in the post-season. Here's a link in case it doesn't turn out well. The table also lists the basic dates for State. Most of these states end their season as early or even earlier than we do. I'm guessing it's because they also have mystery tests that secret superintendents don't want conflicting with the State meet, but I suppose it may also be a concern over heat that moved those State Meets up. With the exception of Mississippi, who ranks last in every meaningful quality of life category anyhow, *every* State in the Southeast allows more post-season entries per event than Kentucky. In Georgia, it's 2 individuals, but you can enter 2 relay teams. Every other state allows more than 2 entries per individual event, although in a couple cases, the extra entries must hit a performance standard to be included. While this kind of change might not help 6 minute miler Johnny get to State and stay motivated, it'll at least provide opportunities for kids who are good enough to run in State and already motivated. As a parent and fan, I agree. I also very much agree. It would only help the quality increase that our state has seen. The poster child for this was Hammond HS in Indiana. In 1975, they had THREE 2 milers under 9:00, led by state legend Rudy Chapa. Obviously, the slowest should be able to qualify in something else, but still - keep a sub-9 guy from competing at State? I am all for this. This year, my "B" team ran the 4x800 at regional for us to qualify, and likely would have finished in the top 10 at state. I also had several distance runners that were not able to run, and would have done quite well in other events at the state meet. It only makes sense to encourage more participation by athletes who run fast enough. This year, my "B" team ran the 4x800 at regional for us to qualify, and likely would have finished in the top 10 at state. I also had several distance runners that were not able to run, and would have done quite well in other events at the state meet. It only makes sense to encourage more participation by athletes who run fast enough. Here is the problem with this system. It gives a clear and distinct advantage to teams that are better and deeper. Do we really want our state championships to include all of the top kids in the state and reward the best teams in the state for being deep? Plus this would allow better kids to take away spots at the state meet from kids who are not as good as them! How would a team that only has a few good kids that struggles to fill all of the events ever have a chance to compete under this system? Should only the best teams have a chance to win? And only the top individuals have a chance to go to state? Here is the problem with this system. It gives a clear and distinct advantage to teams that are better and deeper. Do we really want our state championships to include all of the top kids in the state and reward the best teams in the state for being deep? Plus this would allow better kids to take away spots at the state meet from kids who are not as good as them! How would a team that only has a few good kids that struggles to fill all of the events ever have a chance to compete under this system? Should only the best teams have a chance to win? And only the top individuals have a chance to go to state? @theMike I can see what you are saying.. but, isn't that why we have classes? All of the schools are in a certain class specificially because of enrollment. so, wouldn't they all have an equal shot at getting the numbers as anyone else in that class? I can see what you are saying.. but, isn't that why we have classes? All of the schools are in a certain class specificially because of enrollment. so, wouldn't they all have an equal shot at getting the numbers as anyone else in that class? You forgot your sarcasm tags, which worries me because somewhere out there a coach is reading your post and thinking, "Exactly!" Why not just have a qualifying mark list all individuals hitting that mark or distance during a regional meet quality for state. No team limit. Someone mentioned something to me last week about having two separate state championships. Michigan used to (and may still) do this as they invited all teams who placed first or second in their regional meet to compete the week after the regional to name a team champion so that they could use their entire squad to compete. The week after that was for the state championships and while they still gave out a team title, it clearly meant something very different. Now, they made it work because the coaches association sponsored the team state championships and the MHSAA sponsored the final state meet. @steeplecoach The sectionals were competitive because only 8 advanced to state. There were four sectionals, so only the top 2 advanced with no at-large. In effect, the sectional served as the state prelims. You qualified from the regional to the sectional, and then the sectional basically just pared the field to 8. The state meet was one heat of eight in every event. Nobody really cared for sectional, and I believe they were a real financial sink-hole for the KHSAA. That was part of the genesis of the two-day, 16-per-event state meet format...it basically combined the sectional (prelims) and state (finals) into one meet. The sectionals were competitive because only 8 advanced to state. There were four sectionals, so only the top 2 advanced with no at-large. In effect, the sectional served as the state prelims. You qualified from the regional to the sectional, and then the sectional basically just pared the field to 8. The state meet was one heat of eight in every event. Nobody really cared for sectional, and I believe they were a real financial sink-hole for the KHSAA. That was part of the genesis of the two-day, 16-per-event state meet format...it basically combined the sectional (prelims) and state (finals) into one meet. I just don't see it; I don't think we are that watered down at all. Yes are there kids that could run in an event faster compared to a few who qualify out of bad region sure but that doesn't seem to be changing the outcome of state at all. It seems we are still getting the best to state and they are preforming great across all classes. Would it be nice to see the best run against each other sure? But I just don't buy the whole watered down talk, and adding more than two individuals per event. I mean if a kid can run under 10 for the 3200 he can score points in the 1600, of he can run under 4:30 for 1600 he can score points in the 800. Same goes for girls. On a side note I don't remember anyone really liking the sectional format years ok, athletes or coaches. @steeplecoach Michigan is not the only one, I coached in MN for a few years and they did or do the same thing. They called it a "True Team" Championship, also sponsored by someone other than the State HS Athletic Association. Michigan is not the only one, I coached in MN for a few years and they did or do the same thing. They called it a "True Team" Championship, also sponsored by someone other than the State HS Athletic Association. At the AAA level, I really don't think this would have that much affect except in rare cases. How many schools could field two scoring relay teams considering these 8th-place times from last weekend? 4x800 - 9:56, 8:18 4x200 - 1:46, 1:30 4x100 - 51.01, 43.50 4x400 - 4:08, 3:27 If your 5th-8th fastest runners can combine to hit those times, more power to you. And if you mix your teams to make two scoring teams, you're giving up points on the first team, so it'll be a wash. Now look at the 8th-place individual marks (with the sprints into a significant headwind this year): 100H/110H - 16.39, 15.54 100 - 12.77, 11.09 1600 - 5:23, 4:27 400 - 59.0, 50.78 300H - 47.57, 41.33 800 - 2:23, 1:59 200 - 25.89, 22.46 3200 - 11:19, 9:45 SP - 35-2.5, 46-1.5 DT - 106-1, 144-9 LJ - 16-1.25, 20-11.5 TJ - 35-2, 43-2 HJ - 4-10, 6-0 PV - 8-6, 12-0 Now how many schools are going to come up with a 3rd scorer with those marks AFTER filling out relays and doing other events? I'm sure it would happen, but it certainly wouldn't be common at all. All that is to say that I don't see how there's harm in letting teams enter more than one relay or two individuals in the regional since it likely wouldn't change much at state in terms of team scoring, at least at the AAA level. Now, at the A and AA levels where competition tends not to be as deep, it might make more of a difference. Then again, since those are smaller schools, they tend to not have as many athletes (and thus less depth), so it might even make less of an impact at those levels. At the AAA level, I really don't think this would have that much affect except in rare cases. How many schools could field two scoring relay teams considering these 8th-place times from last weekend? If your 5th-8th fastest runners can combine to hit those times, more power to you. And if you mix your teams to make two scoring teams, you're giving up points on the first team, so it'll be a wash.
Now how many schools are going to come up with a 3rd scorer with those marks AFTER filling out relays and doing other events? I'm sure it would happen, but it certainly wouldn't be common at all. All that is to say that I don't see how there's harm in letting teams enter more than one relay or two individuals in the regional since it likely wouldn't change much at state in terms of team scoring, at least at the AAA level. Now, at the A and AA levels where competition tends not to be as deep, it might make more of a difference. Then again, since those are smaller schools, they tend to not have as many athletes (and thus less depth), so it might even make less of an impact at those levels. @mschardein I generally agree that the current system is pretty good. Having 2-3 kids fall off the back of the 3200 pack and waiting 2 extra minutes for them to finish is not a disaster. But, there are a few cases where an outstanding kid gets left out (or at least forced into something other than their speciality) because of the 2 per event limit. This would be an especially big problem with say three great vaulters or high jumpers at one school, what else do you put them in? Does this have some impact on the team scores, yes, a large impact, probably not. I generally agree that the current system is pretty good. Having 2-3 kids fall off the back of the 3200 pack and waiting 2 extra minutes for them to finish is not a disaster. But, there are a few cases where an outstanding kid gets left out (or at least forced into something other than their speciality) because of the 2 per event limit. This would be an especially big problem with say three great vaulters or high jumpers at one school, what else do you put them in? Does this have some impact on the team scores, yes, a large impact, probably not. All fine and great for normal schools with normal distribution of talent. But for a private school like St. X there is already that finely disguised perception of recruited, out of area, it is here to stay but if you make it even more advantageous to be a prep school there won't be any sense of fairness left. Two relays teams per school would be a disaster. Inner city private schools could take top 8 places conceivably in some events, same for some of the distance programs. Now having said that if my 5th grader who runs a 5:34 mile continues to improve yeah Ill Probably be there to so I'm not Knocking better coaching, unlimited budgets and state championships year after year but a kid who runs a 2:18 800 and she is the 5th best on her team is going to be running somewhere in college regardless of whether she makes state meet. She isn't getting punished. Very few real teams have a depth problems, real I mean you go to school where u live. It makes it level. A kid that works is gonna get discovered no matter what. Why don't we just play 10 on 10 In basketball or 15 on fifteen in football. Not much fun now would it be if a little school in the hills sends their runner to state and she sees fast heat has eight kids from one or two schools. Basketball power Dematha sent their whole roster to college I believe for over two decades. Some of those kids rarely seeing the floor. Competitive balance and fairness Is different than where a kid gets his or her best shot at getting an expensive college education paid for. No one is pushing for class basketball in Kentucky it keep it magic but rarely does a good mountain school send kids on to the top level. The big schools and privates are rich already. Lets let everyone dream and maybe once in a while the little guy might have a chance. That 5th guy on the team at Ballard and Trinity is getting a free ride anyway. I'm talking facts not bitterness. Cause mine might wear green to someday, but not to win a team state championship but to be the best she can be. Outside of that let's let the little guy dream a little. In basketball or 15 on fifteen in football. Not much fun now would it be if a little school in the hills sends their runner to state and she sees fast heat has eight kids from one or two schools. Is different than where a kid gets his or her best shot at getting an expensive college education paid for. No one is pushing for class basketball in Kentucky it keep it magic but rarely does a good mountain school send kids on to the top level. The big schools and privates are rich already. Lets let everyone dream and maybe once in a while the little guy might have a chance. That 5th guy on the team at Ballard and Trinity is getting a free ride anyway. I'm talking facts not bitterness. Cause mine might wear green to someday, but not to win a team state championship but to be the best she can be. Outside of that let's let the little guy dream a little. @Ecooper023 I think it's important to separate perception from reality in a discussion such as this. It might be perceived that somebody like Male could score 4 or 5 in the 100 or 200 or that Assumption would take all the hardware in the 1600, but is that a realistic possibility? Take a look at the marks above for the last scoring places at AAA state this year. On this very site you can look at each teams seasons best lists. The information is readily available. I challenge you to show where any team could rack up significantly more points with people not already running. A good place to start would be places where a team had two scorers in an event, because if they can't score the two they get now, they sure can't score a 3rd or 4th one. That cuts out about half the events right there. As you do this, try to do it from a coach's perspective. There's a lot more to putting together a line-up for the regional than just sticking your best kids in all the events. You balance things like individual vs. relay points, a chance for a kid or a relay to win a state championship in one event vs. scoring decent points in 2 or three events. Chances are, in most cases, even if you have 3 or 4 kids capable of scoring, you still wouldn't always put them in that event because they might do more good elsewhere. I think it's important to separate perception from reality in a discussion such as this. It might be perceived that somebody like Male could score 4 or 5 in the 100 or 200 or that Assumption would take all the hardware in the 1600, but is that a realistic possibility? Take a look at the marks above for the last scoring places at AAA state this year. On this very site you can look at each teams seasons best lists. The information is readily available. I challenge you to show where any team could rack up significantly more points with people not already running. A good place to start would be places where a team had two scorers in an event, because if they can't score the two they get now, they sure can't score a 3rd or 4th one. That cuts out about half the events right there. As you do this, try to do it from a coach's perspective. There's a lot more to putting together a line-up for the regional than just sticking your best kids in all the events. You balance things like individual vs. relay points, a chance for a kid or a relay to win a state championship in one event vs. scoring decent points in 2 or three events. Chances are, in most cases, even if you have 3 or 4 kids capable of scoring, you still wouldn't always put them in that event because they might do more good elsewhere. @BCrumbo While I agreee that these situations are not all that common look at the boys 1600 this year, St. X has 5 of the top 7 times in AAA. Your correct that they didn't score two in that event but that doesn't mean that they would not have scored more if the other guys has been allowed to run, one guy had a less than stellar day. Team wise St. X still would have been 2nd but they could have closed the gap a bit. While I agreee that these situations are not all that common look at the boys 1600 this year, St. X has 5 of the top 7 times in AAA. Your correct that they didn't score two in that event but that doesn't mean that they would not have scored more if the other guys has been allowed to run, one guy had a less than stellar day. Team wise St. X still would have been 2nd but they could have closed the gap a bit. @CoachMark Ah, I was hoping someone would bring this up. Let's look at this situation. Yes, X had 6 of the top guys in the 1600 this year, and all those guys ran at state. Reader and Mudd ran the 1600, but Cave and Mulloy ran the 4x800 and 800, and Sheryak and Striegel ran the 3200. If all those guys run the 1600, then X doesn't win the 4x800, Sheryak probably isn't state champion in the 3200, and the other guys probably don't score as well as they did. They would lose as much or more than they would gain by scoring another 6th, 7th, or 8th in the 1600, and they'd likely lose two state championships. This is what I was talking about when I said you can't just look at raw times and theorize that somebody would just load up an event. The realities of team scoring and chances at individual championships play a big factor in what races you decide to run. Ah, I was hoping someone would bring this up. Let's look at this situation. Yes, X had 6 of the top guys in the 1600 this year, and all those guys ran at state. Reader and Mudd ran the 1600, but Cave and Mulloy ran the 4x800 and 800, and Sheryak and Striegel ran the 3200. If all those guys run the 1600, then X doesn't win the 4x800, Sheryak probably isn't state champion in the 3200, and the other guys probably don't score as well as they did. They would lose as much or more than they would gain by scoring another 6th, 7th, or 8th in the 1600, and they'd likely lose two state championships. This is what I was talking about when I said you can't just look at raw times and theorize that somebody would just load up an event. The realities of team scoring and chances at individual championships play a big factor in what races you decide to run.